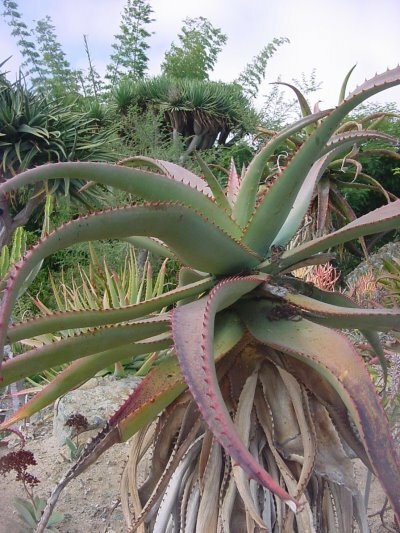 Aloe africana, aka African aloe or spiny aloe in English and uitenhaagsaalwyn in Afrikaans, has a stem up to 6' tall and occasionally taller, topped by a dense rosette of firm, spreading to recurved lance-linear leaves which are gray-green in color and marginally armed with reddish teeth. It is restricted to the Eastern Cape province of South Africa, particularly common in thicket and renosterveld vegetation around Port Elizabeth and Uitenhage. The inflorescences can be either single or branched into several tapering racemes of curved tubular yellow flowers. It blooms from July to September. It grows in proximity of and may hybridize with Aloe ferox, A. pluridens and A. speciosa.